Faitron is excited to announce a new design for HeatsBox. The design is now streamlined to ensure the product will be available at a sooner date. Many of the features are the same and advancements have been made to improve the product. Our new design is shorter and more compact, thus making the HeatsBox lighter. A smaller and lighter design makes the HeatsBox even more portable. The smaller size also makes the heating process more efficient. The entire design, including the plug, is now waterproof. This is an entirely new feature of the HeatsBox and simplifies the cleaning process even more. Some modifications have been made to the inner dish making it easier to remove, however it is still crafted from aluminum and can hold up to 28 ounces. Additionally, the insulation and sealing has been improved to ensure the food remains warm and there are no spills. The most notable difference is the lid which now utilizes a latch mechanism. This new lid makes HeatsBox easier to open and close while establishing a strong seal. Overall, the new design is sleeker with a smoother lid and no edges throughout. 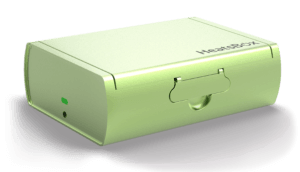 Faitron is now launching HeatsBox®, the first worldwide smart heating lunchbox.